Each fall right at the time of the equinox splashes of brilliant crimson appear along the roadsides and rice patties of southern Japan. These are the flowers of the red spider lily, Lycoris radiata. Like many plants associated with Japan and its people, this flowering bulb is another transplant from China. In Japan it has become culturally significant for religious, cultural, and even practical reasons. Like many members of this small genus, it has an odd genetic history and apparently much of its distribution is the result of human hands. 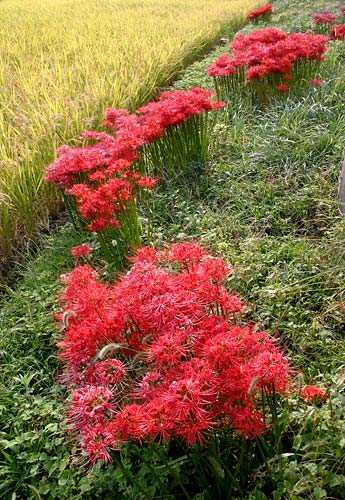 Lycoris radiata flowers in sync with the ripening of rice, making a wonderful display. Earthen berms around rice patties are the most common habitat for this species in Japan. By the 2nd or 3rd week of September, the flower stalks of this plant arise to the height of 30-50 cm and are crowned with a circular cluster of bright red flowers. These are indeed spidery in appearance since all of the flower parts are relatively thin and long. The sepals and petals are essentially identical in shape in size and recurve backward. Their margins are either flat or slightly undulating and are 4-6 cm long and about 1 cm wide. The pistol and stamens are long, curving upward in graceful arcs, each between 6-8 cm long. As the flowers age the red color fades a bit and pink striations form giving them a peppermint striped appearance. The flowers fade within a week or so, and almost immediately new leaves emerge from the subterranean bulbs. The leaves look much like a daffodil’s and are a dark green color with a hint of blue. They take some time to form but eventually can reach up to 30 cm or more and are 1-2 cm wide. These persist all winter long, fading sometime in late spring. As mentioned, these plants grow from bulbs that are typical looking with a scaly outside covering and are anywhere from 5-8 cm long and 3-5 cm wide. They readily form offsets, so plants left alone quickly form large clumps. Virtually all plants found in nature exist as clumps rather than as single individuals. 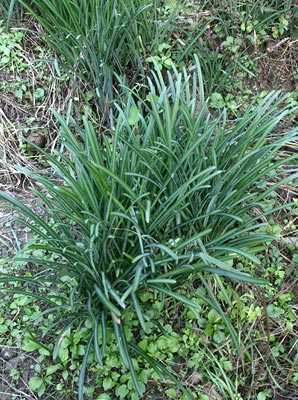 The leaves of Lycoris radiata look much like a common daffodil, but they grow in the fall just after flowering and persist all winter. This common plant is found in the warmer regions of Japan, but in fact is a transplant from China. It is also found in Korea where it is equally exotic. Habitats range from fields, roadsides, river banks, to bright wooded groves, but it is most commonly found on the berms of rice patties in full sun. It has naturalized in some parts of the southeastern USA, but I suspect these plants were put there by people years ago and persisted after their owners left. What a strange plant this is in nearly all respects. One common English name for Lycoris is “surprise lily” since they come out of the ground in mid to late summer with gaudy clusters of flowers perched on top of leafless stalks (for the same reason they have earned the name “naked lady”). The leaves follow the flowers after they fade and last all winter long only to go dormant in late spring. What is more curious is that virtually all Japanese and Korean plants are sterile triploid plants that can only be reproduced through vegetative propagation and presumably were distributed over a wide geographic region by humans exclusively. The probable origin of these sterile plants was China some centuries past, where the plants are fertile and represented by the smaller variety pumila – another odd twist in this unusual plant’s history. A creamy yellow flowered plant is often seen flowering alongside the normal red form, L. albiflora. Much speculation has surrounded this plant with some believing it just a variety of L. radiata while others suggesting it is a hybrid with that species. After DNA testing and hybridization experiments, the plant has been determined to be indeed of hybrid origin and a sterile diploid. The other species in this cross appears to be L. traubii, a yellow flowered endemic of Taiwan and Japan, and closely allied to L. aurea. The bulb of Lycoris radiata is a typical tunicate bulb much like a daffodil’s. These grow side bulbs and form large clumps in time. Unlike daffodils, Lycoris species do not like being divided and so should be left alone in order to flower well. Lycoris radiata is nearly always found within eye-shot of rice patties, and is thought to have been planted in times past as a deterrent to rodents since the bulbs are poisonous. The flowers ignite the patties with a hot electric red precisely at the onset of the fall equinox and the full ripening of the yellowing rice. The image this produces is startling. Although everyone seems to like this flower, few grow it in their gardens while other Lycoris species, especially L. aurea, are frequently seen in private yards. One reason I’ve heard for this is that the flower is so red that it would be unlucky to grow them at home – undoubtedly a result of its association with dead relatives, making it an undesirable garden flower. Interestingly, farmers rarely cut these flowers when mowing the berms in which they grow – rather they cut around them. Regardless of its origins and myths surrounding it, this is one of Japan’s hallmark seasonal flowers, and will no doubt grace Japan’s rice patties for years to come. It’s Japanese name is higanbana, meaning “the other shore flower”, from the Buddhist term higan (“other shore”) and Japanese bana meaning “flower”. “The other shore” is Nirvana, where earthly matters are “blown out” and replaced with enlightenment and nonphysical existence. Since L. radiata happens to bloom during ohigan, a time when people travel to their ancestor’s graves, it is associated with the dead, and to a lesser extent the autumnal equinox. Because higanbana blooms without leaves, is blood red, often grows near graveyards, and flowers exactly at the time of ohigan, its flowers are thought to be the departed souls who are on their way to “the other shore”. It is also said that the souls are being guided by the flowers to paradise. Another Japanese name for it is manjushage, which is a flower found “in paradise” and derived from Chinese legend. The stories spun around this flower are nearly endless. Just as the rice fields ripen golden yellow, Lycoris radiata and L. albiflora come into full flower. This marks the beginning of true autumn in Japan. 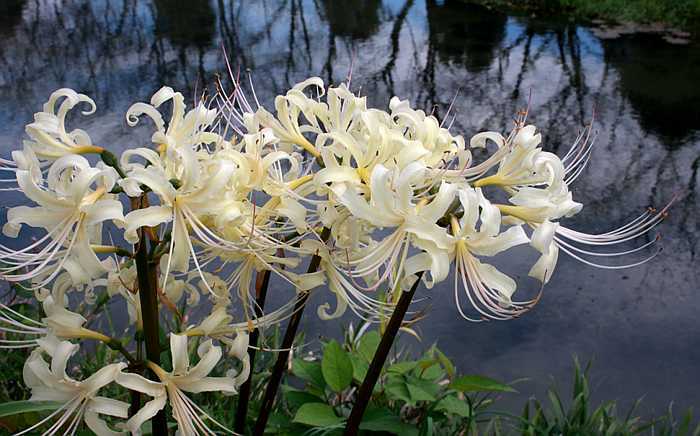 In the west Lycoris species have been given a wide variety of names, including spider lily, surprise lily, naked lady (though this is most associated with L. squamigera), resurrection lily, hurricane lily (AKA storm lily), and cluster amaryllis. The genus is indeed in the Amaryllis family and one quick look tells that tale. The name Lycoris is that of a Greek goddess, but also apparently was a real person as well and lover to Roman statesman, including Mark Antony and Marcus Junius Brutus. 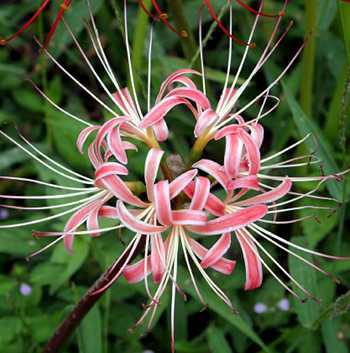 Stressed or aging flowers of Lycoris radiata often become striated with white and pink, making them look like living ribbon candy. Resist eating them though, since all parts of this plant are poisonous. I’ve found this to be an easily grown plant once it gets established. After moving (even freshly dug ones) they tend to flower poorly the following year, or not at all. Usually by the second year they have settled in and will put on a good show however. Lycoris bulbs that have been dried for a long time (such as those in stores) take even longer to flower. Unlike daffodils, they detest being divided and thus should be allowed to clump if you want to see their flowers. They prefer quite a bit of moisture, although I’d avoid keeping them wet – just as likely, they do not appreciate dry conditions. Any decent garden soil should do fine, but the reaction should be acidic. 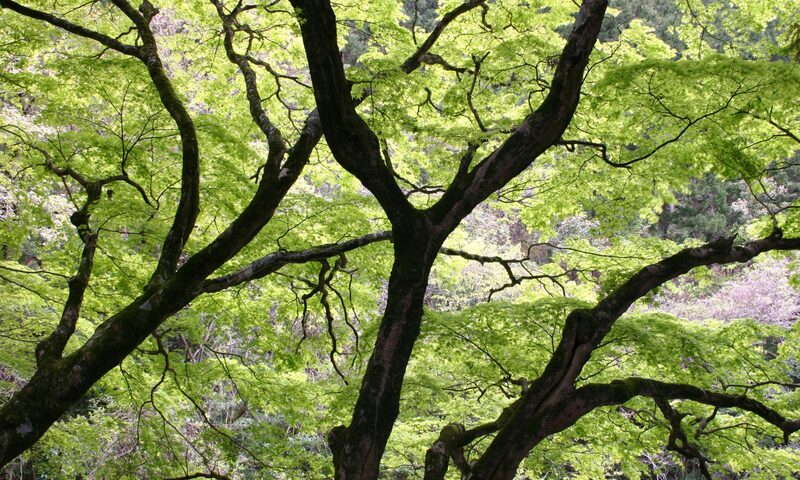 In Japan they grow in rich volcanic loam. While plants will live and even flower in bright shade, their flower stalks will be weaker and flop down. Full sun is ideal, and in these conditions they will become large clumps in time. This is a stunning fall flower for southern temperate climates, USDA cold hardiness zones 7-9. Red spider lily – surprise lily – higanbana: no matter what you call it, Lycoris radiata is a distinctive plant that demands attention, especially when in flower. If you have a sunny, warm garden with not too severe winters, I recommend trying this one. A creamy yellow flowered plant is a common companion to its red flowered cousin. 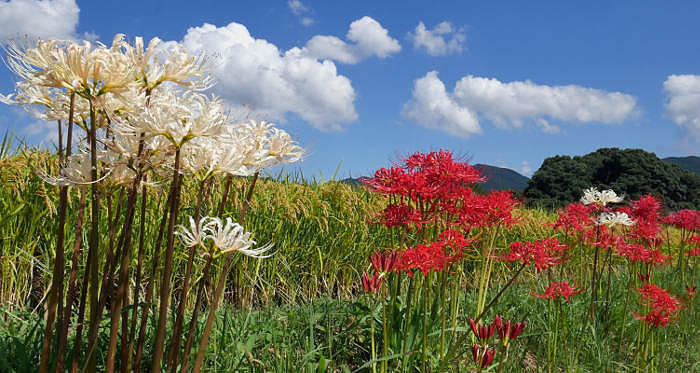 It is Lycoris albiflora, a sterile hybrid made from L. radiata and another Japanese species, L. traubii. The University of North Carolina at Chapel Hill used to have lots of red Lycoris at its Coker Arboretum. At the time, the Arboretum was neglected and the Lycoris were left to proliferate in peace. The advice to leave Lycoris bulbs alone doesn’t fit into gardeners’ habits of constantly digging things up. Hey David, yes, I have noticed that folks seem to want to split up clumps of Lycoris and spread them out – much like you should do with daffodils. There’s no harm in it, but you’ll definitely get fewer flowers that way. I am expecting a shipment of Lycoris radiata tomorrow. By the end of the day, they should be planted near some Hippeastrum ‘fairy tale’ (garden amaryllis) that are performing well and look likely to be permanent. Best wishes with the plant encyclopedia. A somewhat similar, multi-author project in Florida is Floridata. Have fun with your new lycoris David. I highly suggest getting L. albifloria if you can source any. They are a nice companion to L. radiata and just as straightforward to grow. Yes, the format of Floridata is similar to my site, but I will always keep mine a personal legacy – for good or bad and no matter where I end up living. I divided my Lycoris Radiata this yr and only got 2 blooms this oct. Very disappointed,now I have decided not to disturb it again. Also I would like to ask any source of L. albiflora ? Its been a long time since I am searching these creamy white lycoris. Thank You ! Yes, it is a hard lesson – don’t divide Lycoris unless you are trying to propagate more. I find they take a couple seasons to regain strength to flower well again. Dried bulbs with no roots are the hardest to get going again. I’m not sure of sources outside Japan – I know that Van Bourgondien has sold them in the past, but a bit pricey. Hello! Nice article. I can say with certainty that UNC-Chapel Hill does indeed have L. radiata in the Coker Arboretum. (In response to Mr. Martin’s comment from last year) I work there! The original bulbs were brought back from Japan during WWII and planted shortly thereafter, as one story has it, without Dr. Coker’s permission. He did grow to love them and appreciated the opportunity to try them out. 70 years later, their progeny continue to multiply and we can offer a great viewing in October. There are literally thousands throughout the gardens that make up our 5 acre arboretum. I really need to transplant a few clumps. Will that affect the flowering for the following year? Really glad I found this post so I know not to spread them out. Transplanting Lycoris clumps is fine, just be sure to get as much root as you can. You may see a slight decrease in flower count, but they should recover quickly. Of course you can carefully separate them (with the roots intact!) if you want more clumps, however you’ll have to wait for them to pick up speed over the coming seasons. 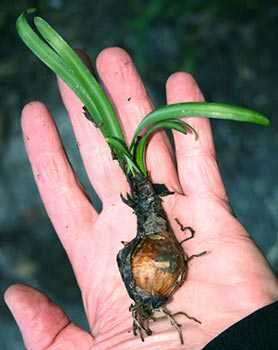 Rootless, dried bulbs are the slowest to recover by far. I have a pot of L. radiata that has remained in leaf continuously since I bought them four years ago. Of course there has been no flowers that entire time either. I was not even certain that they were L.radiata as I remember being told they were not available but came with my order in a bag with a hand written label anyway. Your pictures and description of the leaves have convinced me that they are. How should I go about convincing them to go dormant? Last summer I let the pot get quite dry between watering with just enough to prevent the soil from completely going bone dry. They kept their leaves and this fall put out a substantial amount of new leaves. I keep them potted as they are not hardy where I live. It is hard to diagnose the problem without knowing more about the conditions you are growing them in. These are plants that do best in full sun in an open air environment. The soil should be fairly rich and continuously moist. They also require a strong seasonal change, cool and moist in winter and hot and moist in summer. My guesses would be that you are growing them too dark or they aren’t getting clear signals about seasonal shifts. If you are growing them inside that may also pose a problem. In colder environments I suppose they might do well in an unheated, however frost free greenhouse or cold frame. I don’t know if any of this helps! That’s what your flowers may be missing. Look for articles about this flowers as they bloom in old Southern Cities – like Montgomery Alabama – where I am finding hundreds in the old neighborhoods – even if the home is gone and you are left with a field. I have seen here that it takes a rain for them to show up in the fall – and I have heard when it’s a dry year they may not come up at all. Thanks, I think I know the problem now. I have been bringing them inside for the winter but have them where it is way too warm. The temp through the winter is around 70 – 75 F. all winter. I have a sunporch that is heated to only 48 -50F, so will move them in there and see what happens. I do keep them moist in the winter but may have been drying them out too much in the summer. Yeah, that doesn’t sound good. This plant needs a cool rest period, so your sunporch should do fine. The above comment by Madeline is correct too – keep them moist! This species does not like dry roots ever, not even during dormancy. Hi Tommy – thanks for the article, really good information. Found this site – thanks for so much information. I do have one question about moving a clump. Is there a “best time” do to that? Ours are just finishing their bloom. Do I move now, or wait until after their leaves have yellowed in the spring? I’d wait until spring after the foliage dies down. Be sure to keep the roots intact when moving. Should I leave the faded spider lily flower stems or cut them back? You can cut them or leave them depending on your preference. If they are L. radiata they cannot produce seed, so dead heading the seed pods won’t make any difference. In Japan the farmers cut back plants to the ground in the fall since they grow on the grassy berms of rice patties and the plants thrive. The key is to allow the winter leaves to grow until they fade in spring. These bulbs are tough as nails. Even the small ones will grow and bloom in a couple of years. They are for sale in the Mississippi Market Bulletin.